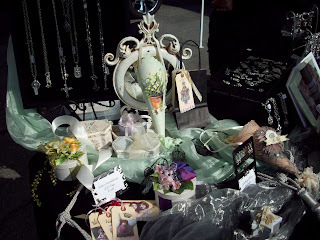 I had a great time yesterday at the Ventura Flea Market. First of all, it was great because it did not rain, like the last time, so that was the first plus. My husband Mark and I got there a bit early to see what we could find. 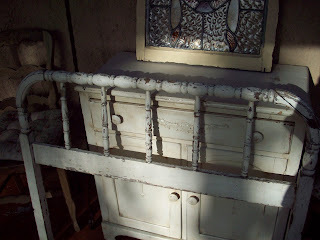 The first thing I found was this old bed headboard, from my friend Karen's booth. I think I am going to somehow incorporate into my garden. Mark and I walked all around the flea market, and I didn't find much else in the next hour. 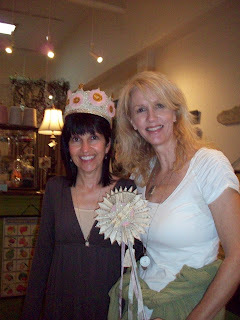 I was getting excited to meet Jamie of Simply Me Art, and Debbie Kay from My Vintage Daydreams. As you know, I had met Jamie previously in the month, at a Tuesday flea market near her home. I was excited to visit with her again, as we hit it off right away. So as it got nearer to the time to meet Jamie, I went to the front gate to wait for her, and there she was, ready for a day of shopping. We walked a little bit, then I got a call that Debbie and her friend Tina had arrived. By this time Mark went off to look around, and read his book that he had brought, so the girls could shop. I went up to the front gate to meet Debbie and Tina. I brought them back to meet Jamie. We were all very excited to meet. It's not everyday you get to meet a fellow blogger. 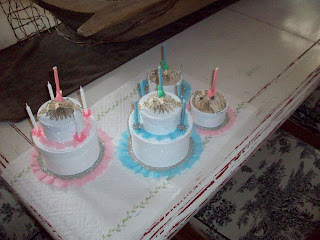 I then took them all to meet Jennifer Grey of www.theoldpaintedcottage.com/ That was fun!! They loved Jennifer and her lovely wares. We walked, talked and shopped non-stop. 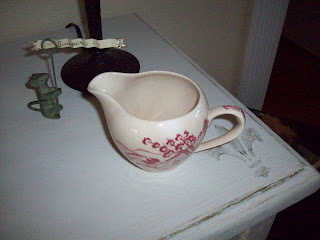 The only other thing I bought the rest of the day was this cute little red and white creamer. Later in the day Debbie and her friend parted to do a little more shopping, and to pick up a big mantle that Tina had bought from my friend Karen. Jamie and I waited for my husband to return, and we decided to go into the town of Ventura, to see my friend Barbara's shop Garden Memories. http://www.gardenmemoriesgifts.com/ Jamie enjoyed Barbara and her shop, as I new she would. I have to say that the highlight of my day was when sweet Jamie surprised me with one of her beautiful jewelry pieces. This gorgeous bracelet. I was very excited to receive it. Jamie is so talented. I was fascinated just watching her sift through all of the vintage jewelry, looking for the perfect pieces to use in her beautiful art. I think everyone had a fun day!! Can't wait to do it again soon. 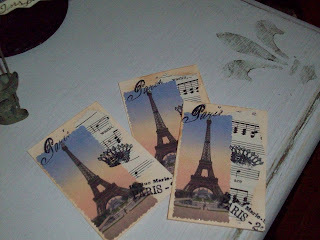 I decided my theme was France. 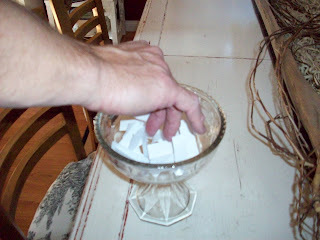 I waited until my husband Mark got home from work, so he could draw the 3 winners for me. Thanks honey! Here is the drum roll!!! Congrats ladies. Please email me, so I can send out your cards. I hope you like them. It was a fun little giveaway. If you can, try to keep the giveaway going. You only have to make 3 little cards. I hope you all have a wonderful weekend! I will be meeting Jamie and DebbieKay at the Ventura Flea Market on Sunday. Can't wait! Sorry I haven't had the chance to visit you all today. 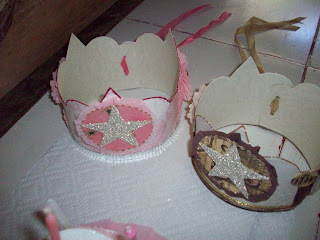 I have been a little busy making more crowns, wands and birthday cake boxes. I did get a nice surprise in the mail today, all the way from Australia. 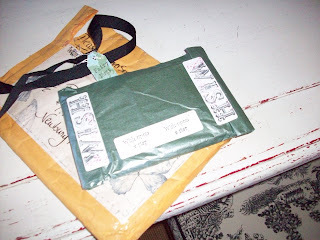 I won Alison Gibb's ATC giveaway contest. 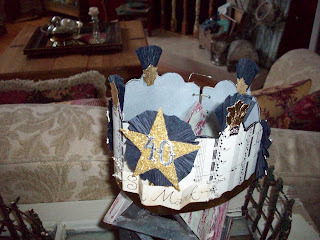 Alison's blog is, creative arts and craft by Alison Gibbs. 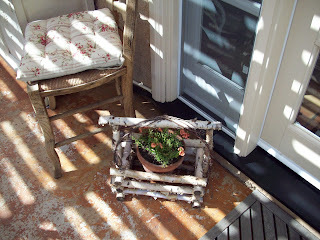 http://alisongibbs.blogspot.com/ If you haven't visited Alison's blog, you should visit her soon. She is the nicest lady, ane you will love her blog. 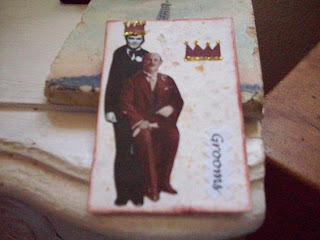 This is the ATC Alison made. The point of the giveaway is to have 3 winners, and they in turn make 3 ATC cards, so the giveaways keep on happening. So If I have the giveaway, and if you sign up for it, it's with the promise of keeping the game going. 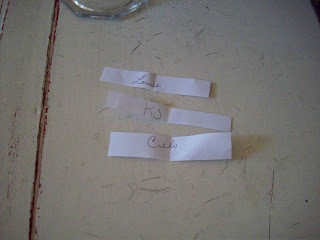 If you want to play, I will make 3 ATC cards, and the winners will each make 3, and have their own giveaway. If you want to join, leave a comment on this post. 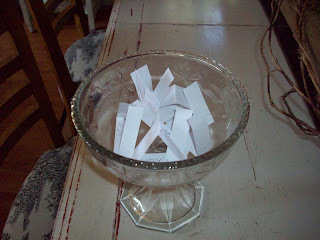 I will close it, and pick the winners on Friday! You can choose any theme for your cards that you want. I haven't decided what mine will be yet. I will let you know on Friday. Oh, by the way I didn't know what an ATC (Artist Trading Card) was until recently. I hope some of you would like to play the game. I hope I explained it right Alison. Little Views of Easter Morning! Hope you all had a Happy Easter today!! We had unusually warm weather. It's in the 80's today here in sunny California! 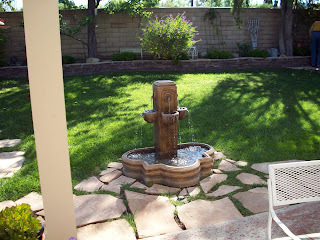 This is our new fountain. 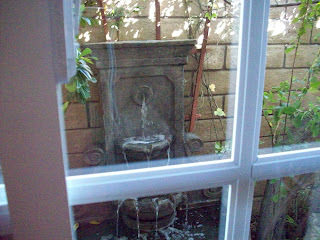 It's right outside the dining room window. It sounds amazing. Getting ready for brunch. Flowers and plants are starting to bloom. We had a lovely brunch this morning. My daughter Amanda, son in-law Joe, and my mom were here enjoying the weather, and the brunch. Our menu consisted of, coffee, mimosas, fruit salad, fresh mushroom quiche, fresh asparagus quiche, ham, turkey sausage, bagels, raisin walnut bread, and lemon cake. We had an Easter egg hunt for my almost 27 year old daughter. She still loves and wants an Easter egg hunt. We all have fun watching her hunt for eggs, until she gives up and I step in to help look for the last ones. I'm taking the rest of the day to relax, and enjoy our great weather. 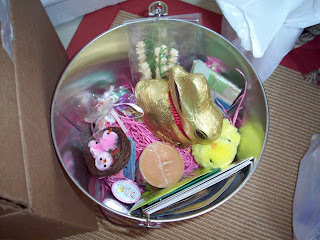 I got a lot of really cute Easter decorations, candy, and craft supplies. 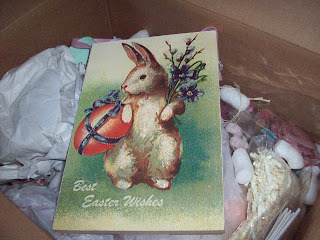 There was one little mishap during shipping, this poor little pink bunny lost an ear. My husband assures me that it can be fixed, so if you are reading this Angelina, don't worry about it. All of these pretties will be put to good use this Sunday, as I am hosting Easter brunch at my home. Thanks again to Angelina and Genevieve. Hope you all had a nice St. Patrick's Day!! 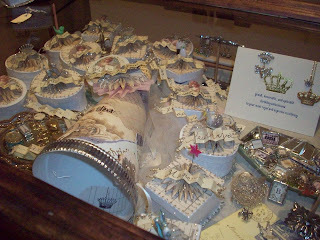 You see, Martha sells her lovely handmade charms at the same shop that sells my boxes, hats, crowns, etc. Martha lives much farther from Ventura than I do, so she doesn't get to the shop very often. We planned to meet there, and I am so glad we did. I showed the charms she made for my daughter, and I a few posts ago. She is so talented, pretty and nice. Martha hasn't had her blog too long, so if you haven't visited her please do. You will love it. I had a pretty good week, considering that I met Jamie of Simply Me Art on Tuesday, and Martha on Saturday. This is a shot of Martha's charms in the case with my boxes. We think they go well together. As you can see, we were having some fun playing in Barbara's beautiful shop. Girls have to play!! At the top of my post is a really nice award that Martha received, and was nice enough to pass on, to me. I in turn will pass it on to, Ashley of http://thedraperhouse.blogspot.com/ and Liz of http://mabelshouse.blogspot.com/ They both are fabulous writers, and if you haven't visited their blogs before, please do. You will be glad you did. Thanks Martha, it was so nice meeting you. Let's meet again soon! 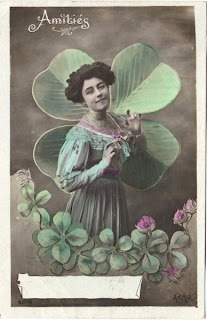 I hope you all have a nice St. Patrick's Day!! 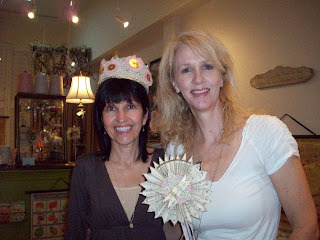 In my next post I will be sharing some pictures of my fun meeting with another blog friend Martha, from MJ Ornaments. We met in Ventura on Saturday. Come back for that! I guess I do! 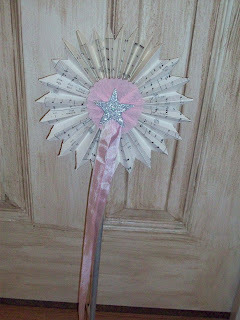 I have been working on a couple of "magic wands" the last couple of days. I wanted to show them to you, before they made their way to Garden Memories tomorrow. As usual, I am covered in glitter. I tell everyone that it is because I have a sparkling personality. 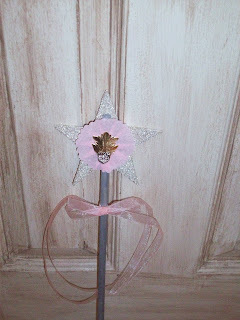 Front view of large wand. 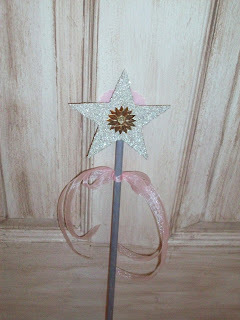 Front view of small wand. I hope you are all planning to have a magical weekend. It's suppose to drizzle here in Southern California. That's good for the flowers I planted today. 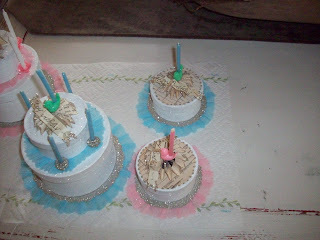 Not for Jamie's outdoor baby shower, she talked about on her blog. I told her, I would pray to the weather gods. 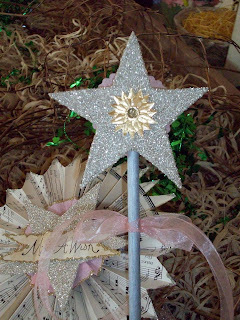 Maybe I will wave my magic wands, so she will have a sunny day tomorrow. Whatever you all have planned for the weekend, I hope it's magical!! Flea Market Finds with Jamie!! I had a very exciting day yesterday!! 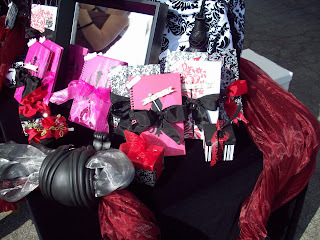 I got to meet my blog friend Jamie of Simply Me Art!! 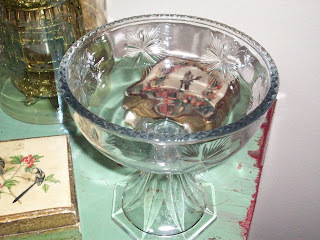 http://simplymeart.blogspot.com/ My husband took a few days off this week, so we decided to try a Tuesday Flea Market, we have been hearing about. It just so happens to be near where Jamie lives. 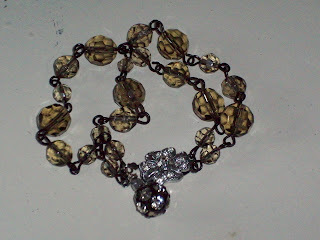 She sometimes picks up some of her antique pieces there, to create her Simply beautiful jewelry. but she is even more beautiful in person. She has a great personality as well, and we hit it off immediately. I could talk to her for hours. Even though I am 10 years older than her, it was like we knew we would be friends. 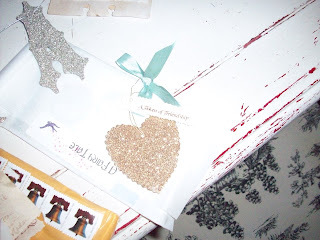 If you haven't visited her blog or Etsy shop, hurry right over. She is a doll, and so creative. These are the two pieces that I picked up at the flea market. 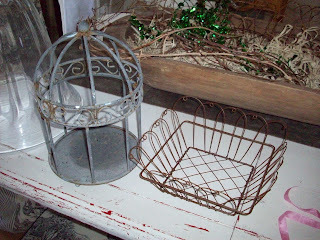 A little wire basket for a mere .50cents, and this cool zinc birdcage for $4. 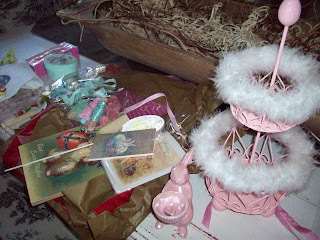 I think the birdcage will go into my garden, with some pretty flowers. 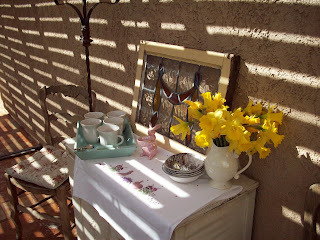 Jamie and I have another flea market outing planned for the end of the month. Can't wait Jamie! 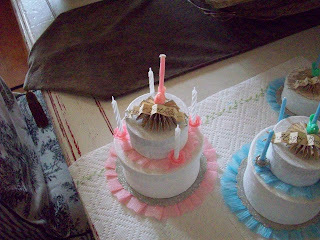 As some of you know, I have been making crowns and party hats, for Garden Memories, as well as Jennifer Grey's Old Painted Cottage. 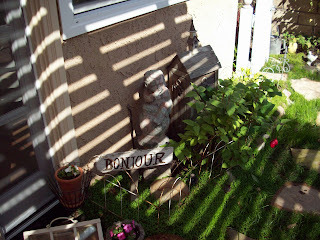 Yesterday I got an email from Barbara, the lovely proprietor of Garden Memories. She had a woman in her shop who saw my crowns, and hats. 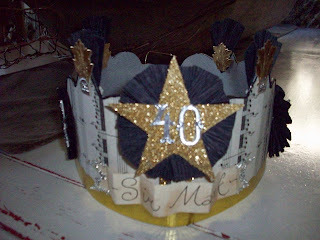 She asked Barbara if I could make a 40Th birthday crown for her husband. Of course I could. I had to think about it for awhile though. 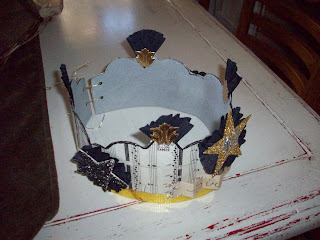 I hadn't ever made a man's crown. Not too frilly, not too glittery, not any pink in sight. The woman wanted black, gold and silver. This is what I came up with. Oh, and she wanted it to say Sir Mark. I think it turned out pretty well. Not girly at all. So this is what I have been up to lately. 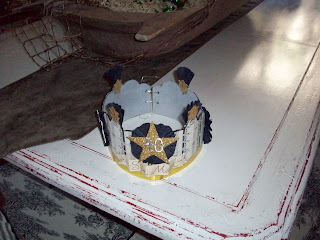 My first King crown, or Sir crown. It was fun to make, and I hope they like it. I went for my walk this morning, and hit a garage sale along the way. 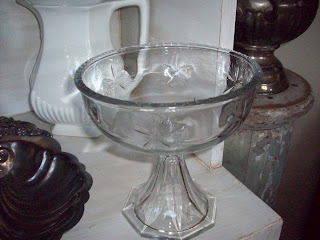 I got this pretty cut glass pedestal compote for $2. Pretty good, I thought. The lady told me it was from the 1800's. It looks really old, but who knows? I don't care, because I like it. Just set it here for the picture. I have to, of course move everything I own around to find the perfect spot. 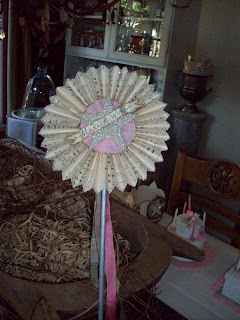 My last post, I showed you my pretty dream banner that I had purchased from Wren Cottage. Some of you asked where I was going to put it. Here, above my front door. I thought it was a nice word to think about, as you leave the house. I hope you are all planning a great weekend!! Whatever you plan to do, have fun!!! A Fun Package in the Mail! I have been so busy making boxes etc. I haven't had much time to visit over the last couple of days. I just wanted to show you the fun package I received a couple of days ago. 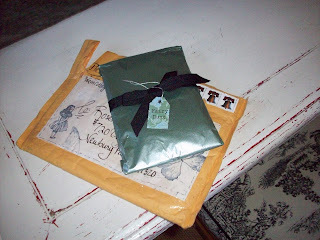 I found out about Madai at Wren Cottage, from Manuela at the Feathered Nest! 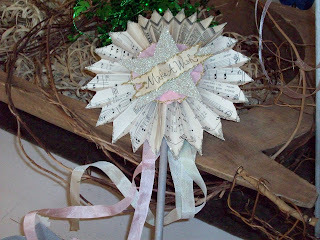 She bought the cutest banner from Wren Cottage Etsy shop. I had to have one too! The wrapping was so cute. Look at the cute DREAM banner. Madai, does such a nice job making these. 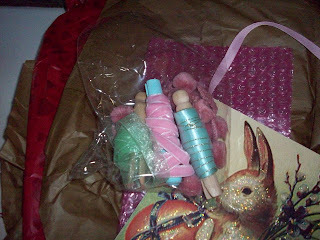 She even added a few little extras to the package. Thank you Madai!! Just wanted to share! If you have a chance visit these shops. You Can't Eat This Cake! We went to the Santa Monica Flea Market yesterday. My friend Heidi had a booth there. 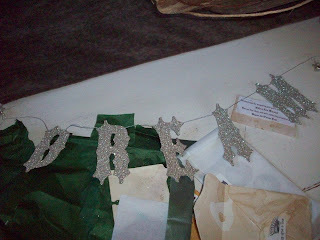 She has been selling very pretty silver jewelry, embellished journals, and vintage type baby clothes. I thought we would pay her a visit. Here is some of her stuff. She mixed in a few of my handmade cones,tags, and boxes. Not only did I get to visit my friend, I also found the best shabby green bench. It is currently in my garage awaiting a big makeover. It will be unveiled on a later post. 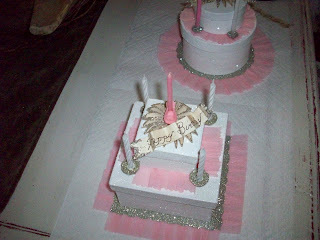 I finished up 4 birthday cake boxes for Jennifer Grey, www.theoldpaintedcottage.com These yummy/low calorie cakes will soon be available on her website. By the way, if you haven't visited Jennifer's site this month yet, she has the new Cottage of the Month up now. 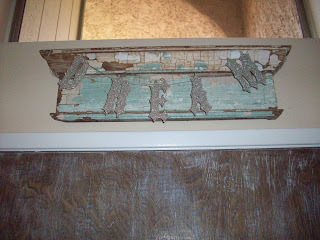 It's a beautiful Shabby and Chic home in Moorpark CA. Check it out. It's kind of a foggy, drizzly day here today. Not a sunny day for the first day in March. 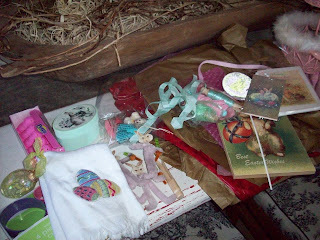 This is a tiny peek at what I am getting ready for my Easter Basket Swap. Even though the weather is not great today, I still managed to find something at a garage sale around the corner from me. 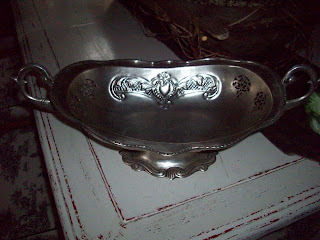 I got this big silver dish/bowl. I love the design. I thought it was worth the $10. I'm not exactly sure what it is made out of. I don't see any markings underneath. It's pretty heavy. 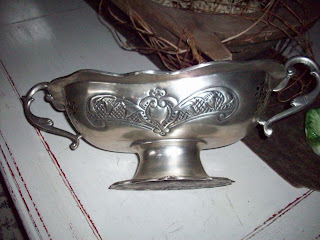 Maybe silver plate or pewter. Whatever it is, I like it. 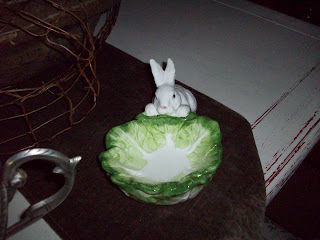 I also picked up this little bunny bowl/candy dish/ whatever you want it to be. I thought he was so cute for Spring/Easter. Well, I just wanted to say hello, and show you my finds.